HineAhua Tokōtokō is her given name by Kaumatua Paraone Patena Mariu in 2012. Paraone was her mentor, since 2005. He said it is his 5th great grandmother's name, she who was brought in as support for the Rangatira, the first Te Heuheu. This name was given to Michelle for her as she comes in as support with the Rongoa. A Kuia later had a dream, Tokōtokō was given to her as she assists in going to the depths of the knowledge. HineAhua Tokōtokō is a registered Rongoa Practitioner who has been working with Native Plant remedies with clients wanting to improve their health since 2012. Check out her page medicineplants.co.nz or join Medicine Plants NZ on facebook. HineAhua Tokōtokō is available for consultation at Marae clinics working alongside other Tohunga and private appointments in Orakei. She continues her specialist level training privately in Hinengaro and Rongoa Rakau, the mind and plant medicines. 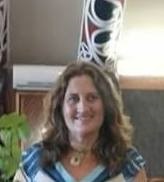 HineAhua Tokōtokō is also known as Michelle Sime. Her lineage is predominantly Scottish and Welsh with her first NZ ancestor living in Orakei 6 generations ago, and she was born and brought up in Whangarei. Orakei whenua (land) is still her home today. Certificate in Rongoa Appreciation, Rongoa Heke (Diploma, Level 5), BSc (Chemistry), grad dip Arts (Psychology), Tohunga.